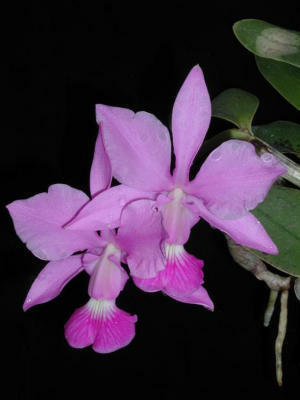 An important update about "Mastering Orchids, Your guide to growing orchids". I am in the final stages, having it proof read and cleaning up some of final touches. I hope to have it available before Thanksgiving. You will be the first to get a chance to purchase it - with a substantial discount. It is over 70 pages and has 50+ pictures as well. Once you start to follow this you will have the best orchids on the block and "you will get bragging rights" as well. Yes, our blog is up and going strong. There are posts to it about 3-4 times a week for you to read. It is a great way to keep informed what is happening. If you haven't tried blogging give it a whirl. Cattleyas are now in bloom. They are one of the easier orchids to grow and when they are in bloom the fragrance from them is great. We have 2 cattleyas that are on special. The color of this orchid reminds me of my dad's blue Datsun. Opps, I'm dating myself. This cattleya will keep it's blooms for 3 months or more. It is a great orchid for gift giving or to pamper yourself. Talk about a true yellow cat. This is it. The fragrance is superb and it will keep on blooming year after year. The cool season is now upon us, one I call orchids Fall season. This is the time when the daylight is limited and the sun gets a little lower in the horizon. There are changes that you will start to see with your orchids. In general, because of the decrease in daylight you will need to water less frequently and also decrease the use of fertilizer. This is the time of the year that orchids reduce their metablolism for the most part. For the Phalaenopsis orchids that are in your home or garden enjoy the weather change and they mostly enjoy the variation in temperatures. In order to stimulate blooming again the variation in temp is needed. Also, to get them ready for blooming you need to get a fertilizer with more phosphorous in it. This is the so-called "blossom booster". Start this one during the next several month and then well into the blooming period. Another little hint, especially if you have a number of orchids coming indoors. Use a cooper based compound to spray on the orchids to prevent "rot" from starting. This is the season where disease and pest love to devour orchids. 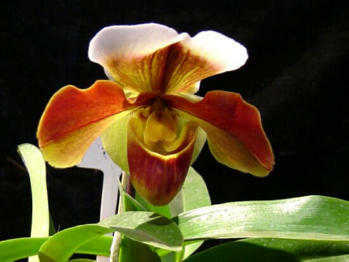 Cymbidiums are the group of orchids for the Fall season that you will find blooming. They generally have a mild fragrance and can have large flowers. The cymbidium season lasts up to seven months. There are miniature cyms as well. Since some of them are large flowers and with many on a spike you will need to stake the orchid plants straight up so they will show the best. Now that they are flowering one should consider getting back to a balnced fertilizer. This is also the season for Paphs to show their brilliance. They enjoy the cooler climates and do much better in them. As they are beginning to flower use a fertilizer with high phosphorous, ie, blossom booster. This will bring out their best coloring for the orchids growth. Paphs don't like to dry out but it is time to not over-water. Cut back a little on the watering so the plant will avoid root rot. This is prevelent at this time of the year for these wonderful orchids. On these orchids there is a sheath that has formed around the bud or spike. This sheath is protective and most likely is turning brown. If it doesn't fall off by itself it should gently removed to allow the bud to open properly. Be watchful for water accumulating around these as it can lead to rotting of the sheath and damage to the orchid this fall. Get ready to have the best looking orchids on the block. You will once you have "Mastering Orchids"